Members of the Will Rogers Stampede Rodeo committee pose with dignitaries during an awards ceremony on Dec. 3 in Las Vegas, where the committee was recognized as the Professional Rodeo Cowboys Association small rodeo of the year. Pictured are, from left, Miss Rodeo America Paige Nicholson, Bob Morton, Dawn Petty, David Petty and Steve Miller with Montana Silversmiths. CLAREMORE, Okla. – David Petty was in shock and couldn’t think of the words to say; his wife, Dawn, couldn’t stop crying. Bob Morton just grinned and took it all in. Their hearts and souls – countless man-hours – have gone into the labor of love they call the Will Rogers Stampede. 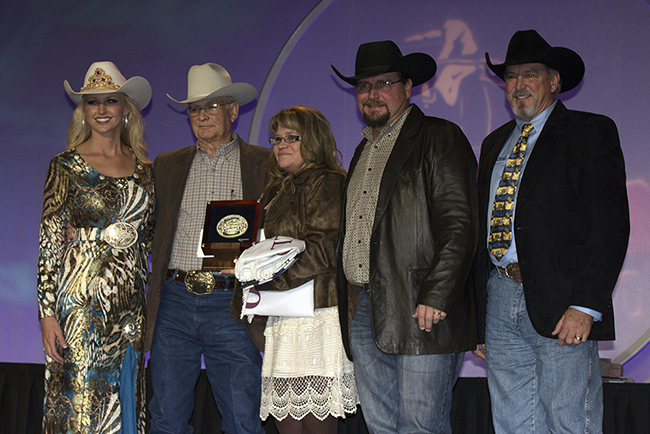 Claremore’s rodeo had just been named the 2014 small rodeo of the year in the Professional Rodeo Cowboys Association, determined by a vote of the organization’s membership and announced during the PRCA’s annual awards banquet on Dec. 3 in Las Vegas, held in conjunction with the Wrangler National Finals Rodeo. “This is a tremendous honor for us,” said Petty, chairman of the volunteer committee that organizes the rodeo every Memorial Day weekend. “We have a small group of people who work really hard every year to put on this rodeo for our community. PRCA members felt the same way. Rodeos are classified in four categories: small, medium, large and large indoor. The small-rodeo category encompasses more than 400 PRCA rodeos nationwide and allows the smaller committees to be judged with events of the same size. Carr was nominated for stock contractor of the year, while other pieces of the 2014 Stampede also were recognized: Sandy Gwatney was nominated for secretary of the year, while entertainer John Harrison earned the Coors Man in the Can and the Comedy Act of the Year awards. Days later, Miss Rodeo Oklahoma Lauren Heaton became the first Oklahoma cowgirl to be crowned Miss Rodeo America; she, too, was part of the pageantry that is the Will Rogers Stampede. “Claremore was part of my 10-day Oklahoma run,” she said. “That’s such a great rodeo that had John and Sandy Gwatney working with Pete Carr; all three of them are working the finals. John Harrison was the clown there.